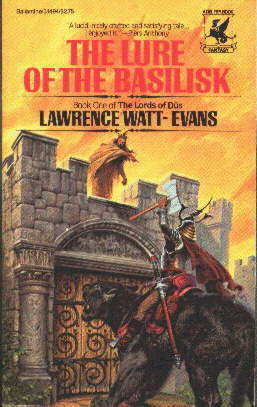 The Lure of the Basilisk was my first published novel, and is the first volume in the four-part "The Lords of Dus" series. There are no spin-offs or related series outside the original four novels and their appendices, nor are any presently in the works, but the possibility of adding some eventually hasn't been ruled out. First published March 1980 by Del Rey Books, ISBN 0-345-28624-3, with cover art by Darrell K. Sweet. Reprinted with ISBN 0-345-31494-8 and others, with a second painting by Darrell K. Sweet. The second printing and all subsequent Del Rey printings (there were at least eight printings) used this second painting. Second edition January 2002 by Wildside Press, ISBN 1-58715-587-7, with cover art by Dalmazio Frau . This novel is also included in the four-in-one hardcover omnibus The Lords of Dus, Wildside Press, ISBN 1-58715-665-2. Links to online booksellers I know to be offering it, including the publisher. An explanation of how I came to write the story in the first place. The text of the prologue, to serve as a teaser. 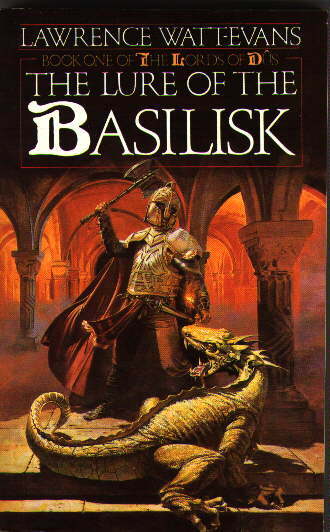 A complete publishing history of The Lure of the Basilisk. A FAQ about the book and the series. The page about the series and the four-in-one hardcover omnibus The Lords of Dûs. So what did I do with myself? Did I go out looking for honest work? Did I apply to another college? Hell, no. I intended to get readmitted to Princeton. The rules at the time allowed this, but required that the would-be reapplicant spend at least one full year off-campus -- to get his/her head together, I suppose. So I wanted something I could do for about a year and a half. I wasn't interested in a mere job, something to pay the bills but that wouldn't go anywhere, and I couldn't very well start an actual career if I intended to cut it off short in sixteen months or so. And there was this anecdote I'd heard -- I don't know if it's true, and I suppose I should ask Larry Niven the next time I see him. The story was that when Niven decided he wanted to be a writer, he gave himself a year -- did nothing but write for a year, while living on his family's money. If he hadn't sold anything by the end of that time, he'd give up and get a real job. Obviously, toward the end of the year he started selling his stories. So I decided to try the same thing. I'd spend my time until my readmission writing and trying to sell what I wrote. If I didn't sell anything by the time I went back to Princeton (assuming I did), I'd give up the idea of a writing career and concentrate on other things; if I did start selling, I could go on while in school and get serious about it after graduation. And the question was, What should I write? There I was in my picturesque garret, with an electric typewriter and plenty of time and motivation, trying to write to sell. What to write? Well, what did I want to write? What did I like to read? Sword and sorcery, that's what. I'd discovered Robert E. Howard's Conan not long before, and Moorcock's Elric, and Lin Carter's anthologies. I decided to take all the stuff I liked and put it together. I needed a hero. I liked Moorcock's use of a not-quite-human hero, but thought his Melniboneans were too effete, so I invented overmen -- which were, incidentally, based more on having read Desmond Morris' The Naked Ape than on Nietzsche. I took my hero's name and noselessness from Simon Garth, the title character in Marvel Comics' Tales of the Zombie. But then I needed something for him to do. I decided that I wanted a series of errands, not unlike the labors of Hercules, but that meant he had to have someone telling him what to do. So I added a mysterious mentor figure, swiping the King in Yellow from Robert W. Chambers for the job. Then I needed an errand. Dragon-slaying is the traditional one, but I thought dragons were passe; I wanted some sort of monster that hadn't been over-used. I considered manticores and gryphons and the like, but settled pretty quickly on the basilisk, which just impressed the hell out of me with its lethality. Petrifying gaze, toxic breath... perfect! But even so, killing it was too easy. I'd have Garth capture it alive! And there I was. I sat down and started writing, without any clear idea where I was going -- certainly without any real outline. The result was a 10,000-word novelet entitled "The Master of Mormoreth," which had largely the same plot as the first 40,000 words of The Lure of the Basilisk, but rushed through it headlong, without any sort of detail. I sent that out to Fantastic, the only sensible market at the time for short sword and sorcery, and went on working on other stuff, including several more stories about Garth. "Master of Mormoreth" didn't sell -- I got a note from the first reader saying he liked it and had sent it on (that's who I dedicated the novel to, by the way), but I never heard back, and when I finally contacted the editor he swore he'd never seen the story. I suspect he just lost it. Anyway, I didn't worry about it too much; I was writing a lot of stories, not putting all my eggs in one basket. I sold one short story in that time I'd allotted myself -- "Paranoid Fantasy #1," in October '74, published August '75 -- which was enough to justify further attempts later on. My application for readmission to Princeton, which was accepted, was accompanied by seventy-one rejection slips, to demonstrate that I was serious about writing and not just playing the artiste. When I went back to Princeton in September of '75 I didn't think much about writing for awhile, but then, in 1976, I began to look seriously at the business end of it, and concluded that (a) all the money was in novels, and (b) short sword and sorcery was dead, dead, dead, but fantasy novels were doing okay. And in May 1977 I dropped out, this time for good -- or actually, I theoretically took an indefinite leave of absence that's still going. And rather than get a real job, I set out to be a writer -- after all, I had that short story sale (and a few articles). I'd written a complete novel during the summer of '76 (the first draft of The Cyborg and the Sorcerers), and that was out making the rounds, but I wanted to write another novel, and I looked through my stack of ideas and unsold stories. So I did. 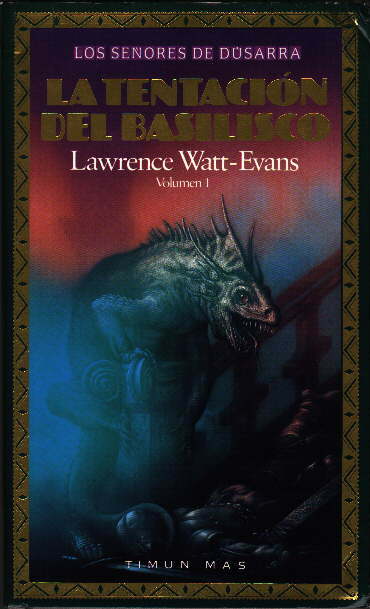 Finished The Overman and the Basilisk (as it was then known) in April 1978, but didn't get up the nerve to submit it anywhere until August, when I mailed it to Del Rey. I submitted that early version of Cyborg at the same time; it came back, rejected, right around Christmas. Basilisk didn't come back, but after a couple more months I decided it must've gotten lost, and I was never going to make it as a writer and I'd better find another way to make a living. So I gave up writing and set myself up in the mail-order comic book business. And on May 10, 1979, I got the acceptance letter from Del Rey, offering to buy The Lure of the Basilisk if I'd make a few minor changes. Which I did. And by the way, was I planning a sequel?
" am weary of all this death and dying." The speaker was a huge armor-clad figure almost seven feet in height, standing at the narrow mouth of a small cave near the top of a snowy and rubble-strewn hillside. Even from a distance an observer would have seen the fading light of the setting sun glinting a baleful red from his eyes, marking him as something other than human. He was speaking to a bent, crouching creature clad in tatters who stood inside the cave's mouth, at the edge of the impenetrable gloom of the interior, her face and form only faintly visible in the dim twilight. She was hunched and humpbacked, shriveled and bent with age. Her face was twisted and broken, her teeth gone, one of her golden eyes squinting horribly, yet she was plainly of the same race as the tall warrior. "Death is everywhere," the decrepit creature replied. "I know that, Ao; I would it were not so." The hag addressed as Ao merely shrugged, and the warrior continued, "It makes life pointless, to know that I and all I know will die and pass away, as if I had never been." He paused briefly, then went on, "I wish that it were possible for me to perform some feat of cosmic significance, to change the nature of things, so that all would look back millennia from now and say, 'Garth did this.' I wish that I could alter the uncaring universe so that even the stars would respond to my passing, so that my life would not be insignificant." Ao moved uncomfortably. "You are a lord, and a warrior, whose deeds will be recalled for a generation." "I am known to a tiny corner of a single continent, and even there, as you yourself say, I will be remembered only for a century or two, an instant in the life of the world." "What would you have of us, my sister and myself?" "Is it possible for a mortal being to alter the way things are?" "That, it is said, is the province of the gods; if the gods are the baseless myth some believe them, then it is the role of Fate and Chance." Garth had apparently expected this reply; there was only the slightest pause before he said, "I would have it, then, that if I cannot change the world, at the least the world shall remember me. I would have it that my name shall be known as long as anything shall live, to the end of time. Can this be?" He stared at the misshapen hag, his usually expressionless face intent. She gazed back impassively and answered slowly, "It is your desire that you be known throughout history, from now until the end of the world?" "This can be done." Her tone seemed curiously reluctant. "Go to the village called Skelleth, and seek there the Forgotten King; submit yourself to him, obey him without fail, and what you have wished will be." "How am I to find this king?" "He is to be found in the King's Inn, clad in yellow rags." "How long must I serve him?" Ao drew a deep breath, paused, and said, "You weary us with your questions; we will answer no more." She turned and hobbled out of sight in the darkness of the cave, the darkness that concealed her sister Ta and their humble living facilities. The warrior stood respectfully motionless as the oracle withdrew, then turned east, toward where the last rays of sunlight lit the iced-in port of Ordunin and the cold sea beyond, and started thoughtfully down the hillside. The Lure of the Basilisk was first published March 1980 by Del Rey Books, ISBN 0-345-28624-3, as a mass-market paperback original. The original cover art is by Darrell K. Sweet. The Del Rey edition went through at least eight printings -- second printing was dated March 1984, fourth November 1985, fifth (labeled third, but it's the fifth) March 1987, seventh June 1988, eighth February 1990. All printings have cover art by Darrell K. Sweet, but there are two different paintings -- Del Rey decided the first was too dark, so from the second printing on it's the second, largely yellow one. The second edition was published January 2002 by Wildside Press, ISBN 1-58715-587-7, as a print-on-demand trade paperback. The cover art is by Dalmazio Frau . 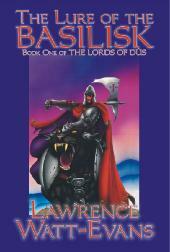 The novel is also included in the four-in-one hardcover omnibus "Lords of Dus", Wildside Press, ISBN 1-58715-665-2. 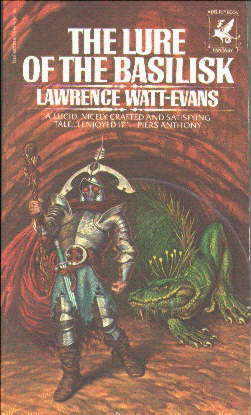 The British edition was first published in 1987 by Grafton Books, ISBN 0-586-07149-0, with cover art by Kevin Tweddell. I'm unaware of any additional printings. 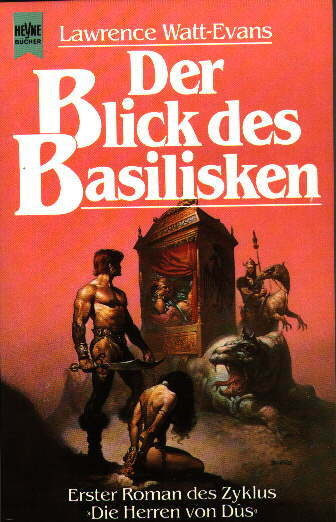 The German edition was first published in 1987 by Wilhelm Heyne Verlag GmbH & Co. KG, ISBN 3-453-00447-7, under the title Der Blick des Basilisken, with recycled cover art by Boris Vallejo. Translation was by Jurgen Langowski, and seems decent, but my knowledge of German is pretty limited. 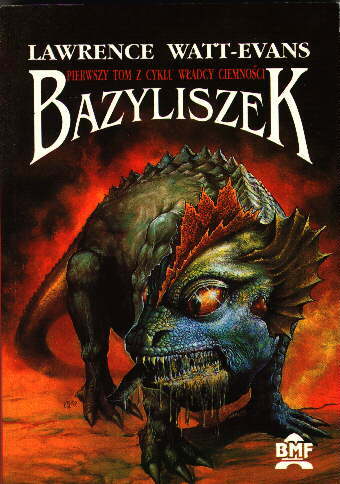 The Polish edition was first published in 1992 by REBIS, ISBN 83-85696-09-1, under the title Bazyliszek, with cover art by (I think) Przemyslaw Ulatowski, and translation by (I think) Tomasz Baniowka. I know no Polish at all and therefore can't comment on the translation, or even be certain I've correctly identified the translator and cover artist. The Spanish edition was first published in 1992 by Editorial Timun Mas S.A., in hardcover, ISBN 84-7722-811-6, under the title La Tentacion del Basilisco. The cover art is by Ciruelo, and I can't find a credit for the translation. This is Castillian Spanish -- it says so on the copyright page -- and the translation looks okay, but my Spanish is even worse than my German. The Italian edition was first published in 1990 by Fanucci Editore, under the title Il richiamo del basilisco, translated by Carla Borrelli, revised by Gianni Pilo, ISBN 88-347-0080-5. The Hungarian edition is pirated. It was first published in 1995 by Valhalla Paholy, under the title A baziliszkusz hatalma. I don't know any details about it; a fan e-mailed me a scan of the cover, but I've never seen a copy, never been paid for it, and never agreed to allow its publication. There is also theoretically a Japanese edition, published by Sakai Shiso. I don't have the ISBN and have never seen a copy. Note: If you have any information about the foreign editions I haven't seen, please e-mail me! Frequently-Asked Questions about "The Lords of Dus"
1. The single most-often asked question: Will I ever write any more about Garth? I honestly don't know. I did plot a fifth novel, back in 1983, but Del Rey never expressed any interest in it, so I never wrote it. I have no plans to do so. However, if Asimov could write more Foundation stories twenty or thirty years later, I'm not about to rule out writing more about Garth. The remaining questions are all things that might be answered in that fifth volume if I ever wrote it; if you don't want to take even that one-in-a-million chance that I'll be giving away secrets you don't want to know, stop here. 2. Will Garth be accepted back into his homeland? He was an outcast at the end of the series. 3. Were all the members of Aghad's following dead? No. Dozens survived, scattered across the continent and disorganized by the loss of their central temple. They would make sporadic attempts to regroup and to avenge themselves on Garth. 4. What changes have occurred in Garth's world as a result of the destruction of the Fifteen Gods? The lesser gods, the Arkhein, who survived, suddenly find themselves proportionately more powerful, and for a few years take the opportunity to interfere in human affairs more than before. Gradually, a new balance emerges and the gods become less whimsical once more. Also, the laws of magic have changed. Much magic depended upon various gods, and therefore no longer works. Science, which really didn't work very well when the gods could change the rules at any time, does work--at least, when the Arkhein don't interfere. Having the cycle of time broken, however, probably has the greatest effect on people. Under P'hul, everything anyone attempted was doomed to eventual slow failure. Under Bheleu, everything was destined to end in disaster. With the Dus gone and the Ages ended, this sort of predestination isn't there; plans can work or not work according to how well they were devised, or ordinary dumb luck. This means that the established order, which had decayed under P'hul and been largely destroyed by war under Bheleu, can finally be replaced by new organizations. What those new organizations would be I can't really say; I hadn't worked out all the details yet. I suspect that the trading empire that Garth started at Skelleth would become a major power, that the Yprian invaders in Nekutta would become another, and that Eramma would fall apart into several small countries. 5. Will Frima be accepted as Baroness of Skelleth? Yes, eventually, because she has Garth with her to enforce her claim, and is pregnant with an heir. It would take some fighting to establish her position, however. 6. Will Garth achieve the immortal fame he has been seeking? No, not really, because nothing is truly immortal. He has, however, made changes enough in the world to content him, and will be remembered for a very long time indeed. And maybe I'll answer them. The first paperback cover. Art by Darrell K. Sweet. This replaced the original on the second and all subsequent Del Rey printings. Art by Darrell K. Sweet. The German cover; art by Boris Vallejo (This was stock art the publisher had on hand, not original for this book). 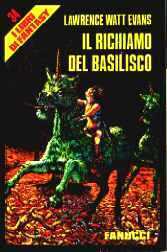 The Italian cover, provided by Ernesto Vegetti. I've never actually seen a copy. The Polish cover, by Przemyslaw Ulatowski (I think; I can't read Polish). 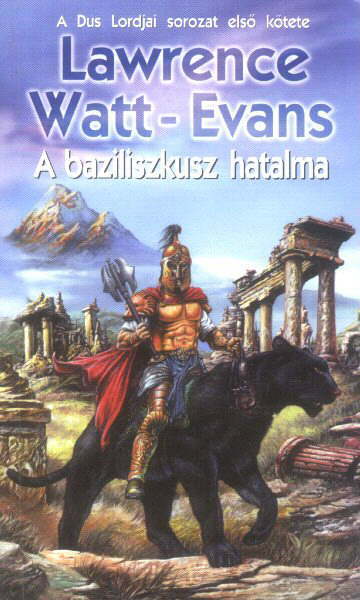 The Hungarian cover. This was a pirated edition.